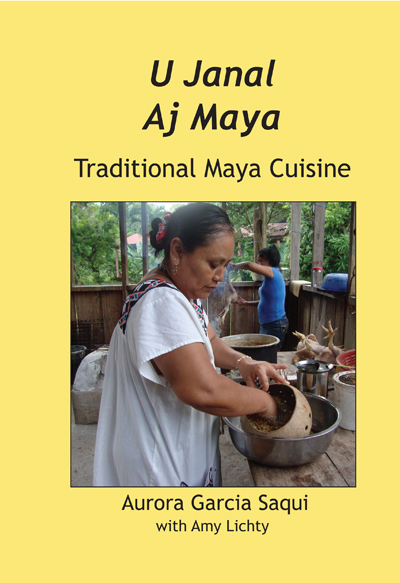 U Janal Aj Maya: Traditional Maya Cuisine is a cookbook written by Aurora Garcia Saqui, artist, herbalist, Mayan activist and cook who was born into a Yucatec Maya farming family in Belize. With this book you can learn how to prepare traditional Mayan food from garden to table with recipes that have been passed down through the generations. The cookbook is written in English with the names of the recipes given in Yucatec Maya, Mopan Maya, Creole, and English. "This cookbook contains those recipes that have been passed down through the generations. I have been serving them to visitors for years. They always ask me how I can cook such delicious food and I answer, “Because I cook with love.” We all know how easy it is to go out to eat in a restaurant, but nothing is better than a home-cooked meal that is wonderfully flavored with native plants, and served with love." Available Cayeboard Connection, Image Factory, and Amazon.com.